The crisis in public services, especially health and social care and the impact of immigration in Ireland are currently subjects of public debate. In the market for labour Ireland has become a destination for East European workers who can't find work at home. The Irish Ferries dispute highlighted how employers here are ruthlessly exploiting vulnerable migrant workers, paying the minimum wage and lower. However, recent calls to restrict immigration to protect jobs and wages would further penalise the victims of IMF and EU neo-liberal policies such as the privatisation and closure of state enterprises and cuts in state spending - which have led to mass unemployment, poverty and pay rates of €3 an hour. Both the OECD and EU acknowledge that it will take 30 to 40 years to significantly reduce current income and employment differences between East and West. So under current policies and trends, migration will continue, driven by economic necessity. The EU's solution to mass unemployment - east and west - is increased competition resulting in a 'race to the bottom'. Promoting immigration control as the long-term solution to problems arising from large scale migration is a dangerous step towards racism. It puts the blame for possible future competition for jobs, or wage reductions, upon the migrants. In dealing with the symptom rather than the cause, it avoids challenging Irish and EU policies and takes us away from a much-needed discussion on a Europe-wide alternative to neo-liberalism. There is growing opposition to the EU Services (Bolkestein/McCreevey) Directive which would make it easier for a repeat of the Irish Ferries situation. The 'country of origin' principle would make it more difficult to regulate services. Competition promoted by the Directive would bring more privatisation, with profits as the priority rather than quality or access to public services. 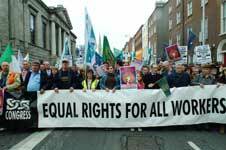 The Services Directive is part of the neo-liberal approach of the Irish and EU elites. Against this backdrop a number of international speakers will address a conference on Alternatives to neo-liberalism in Liberty Hall, Dublin, this Saturday 18 February. Arguing for social justice and an alternative to EU neo-liberalism will be Susan George, a leading figure in the French 'NON' campaign. Contributors will also include Conall Ó Caoimh of Comhlamh and Andy Storey of AfrI. Presenting the case against EU militarism will be Frank Slijper. Irish participation in EU battlegroups will be discussed and Richard Douthwaite will contribute on sustainability. Brian Denny of the RMT rail union in Britain will introduce a section on the EU's role in the privatisation of public services. Contributors will include Mick O'Reilly of the ATGWU. The conference will discuss Irish and Europe-wide alternatives, an end to de-regulating directives, proper funding of public services an end to militarism and policies where social and environmental needs come first. The conference is organised by the Campaign Against the EU Constitution. • Contact: [email protected] or phone: 087 230 8330 or 087 926 6764.